MP PEB Jail Prahari Department Physical Exam Sechdule Announced. 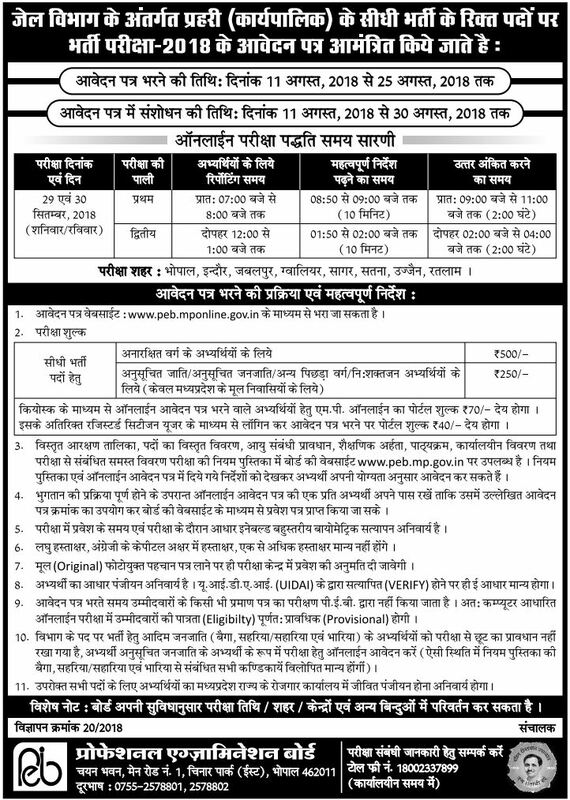 / All Categories / Latest Jobs / MPPEB ( Vyapam ) Jail Prahari Recruitment Physical Exam Sechdule Announced. Jail Prahari Recruitment Physical Exam Sechdule Announced. Madhya Pradesh Vyapam Jail Vibhag notification has been released on 4th August 2018. Eligible Indian Nationals who have completed 12th From Any Board Recognised in India are eligible to apply for Madhya Pradesh Vyapam in Jail Vibhag. M.P Vyapam Jail Vibhag Recruitment Exam will be conducted to selected candidates for the post of Jail Prahari.